Premium Compatible Label Tapes for the Brother P-Touch QL500BS printer. The Brother P-Touch QL500BS is a label printer that uses direct thermal print technology where it requires Brother P-Touch QL500BS Label Tapes instead of ink or toner cartridges. This label printer is suitable for both personal and small office use. The Brother P-Touch QL500BS is perfect for printing address and shipping labels, banners and signage and can print on both die-cut peel-off labels or continuous length tape. This label printer is 14.99 cm in height, 14.48 cm in width and 19.3 cm in depth. This label printer can print at a rate of 50 labels per minute with a printing resolution of 300 x 300 dpi. This label printer uses Brother P-Touch QL500BS Label Tapes. This label printer has a built in power adaptor. The Brother P-Touch QL500BS printer supports mirror printing, barcode printing and copy printing. This label printer has 1 USB port and is Windows and Mac compatible. Also, it is Word, Excel and Outlook compatible. It has a manual tape cutter and can print a label having 62 mm as maximum label width. The Brother P-Touch QL500BS is a label printer that is suitable for both personal and small office use. This label printer supports mirror printing, barcode printing and copy printing and has a good printing speed as well as resolution. It is Windows and Mac compatible but lacks Wi-fi connectivity. This label printer has a very small footprint. Q. Could you please guide me how to create variety of labels with P-touch Editor for Macintosh? I use Brother P-touch QL500BS. Thanks. A. Sure! Please open P-touch Editor and look for P-touch Editor Help from the ‘Help’ menu. When you open the help section you will get all detailed instructions from basic to the most advanced ways of using P-touch Editor to customise labels. You will get information such as how to create nametags, address labels, labels for CD case, banners and more in the list. Q. 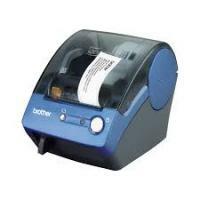 When I use Brother P-touch QL500BS label tapes to create labels the cutter blade does not cut the labels properly. What should I do? A. If the cutter blade finds difficulty in cutting the labels, you can replace the cutter unit. Turn off the printer and remove the power cord. When you expose the label roll compartment, pull up the label lever and take out the Brother P-touch QL500BS label tape/roll. If your printer has a cutter cover installed, open it. Now, loosen the screw (as it cannot be removed completely) of the cutter unit with the help of a cross-head screwdriver and take out the cutter unit. Before you remove the cutter be careful with its sharp edge. Now, take the new cutter unit and place it by aligning the two posts with the two holes inside and pressing it. Using the screwdriver, tighten the screws of the cutter unit carefully. Close the cutter cover (if present). Put back the Brother P-touch QL500BS label tape/roll in the place and close the compartment cover. Turn on the printer and connect the power cord. Q. I want a high quality and fast printing labelmaker for my shipping business. Will Brother P-touch QL500BS suit my needs? A. Thank you for the question. Brother P-touch QL500BS is one of the fastest labelmakers that print at the speed of 50 labels per minute. The printer has ‘speed priority mode’ in the default settings. Besides, the quality of printing is very good. In addition, when you want to print barcodes and graphics the P-touch Editor has a ‘give priority to print quality’ option which further improves print quality. You can get highest quality and fastest speed for every kind of label with this printer. Q. When it says continuous labels, approximately how many labels can I create from the Brother P-touch QL500BS label tape? A. Continuous Brother P-touch QL500BS label tapes enable the user to create labels of desired lengths. Hence, it depends on what kind of labels are printed. You may print 100 to 300 labels approximately from a continuous roll. Q. Can I apply Microsoft Word and Excel add-in to Macintosh system? A. Unfortunately, the Brother P-touch QL500BS printer is featured with MS Word and Excel add-ins that work only with Windows versions and not with any of the Macintosh versions. Q. I have heard that only the genuine Brother P-touch QL500BS label tapes work best with the printer. The compatible ones do not give high quality. Is it true? A. It is actually a myth with some that only the genuine label tapes offered by the brand work best with the machine. But it is not true. The compatible Brother P-touch QL500BS label tapes also work equally great with the machine and provide best quality labels at cheap price. In fact, majority of the printer users are satisfied with compatible label tapes. Our website offers excellent quality compatible labels and we've always received great feedback from our customers. We have a return back policy that gives a flexible option to the user to return back the product if not satisfied. Besides, we also offer 100% money back guarantee.